Average weekly gasoline supplied to the market pulled back 1.9% at 8.565 million b/d (359.7 million gallons per day), equivalent to 131.30 billion gallons annualized and the lowest level since February 2017. Refiner/blender input of ethanol rebounded 5.8% (up 47,000 b/d) at 862,000 b/d—equivalent to 13.21 billion gallons annualized. 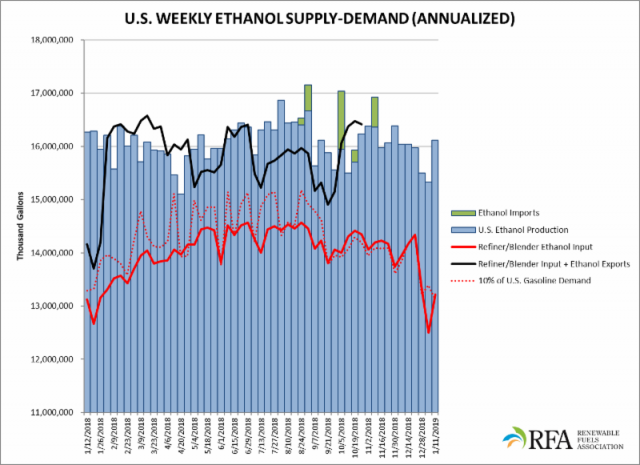 Given the lackluster volume of gasoline supplied to the market, daily ethanol production increased to a 58-week high of 12.27% of daily gasoline supplied.